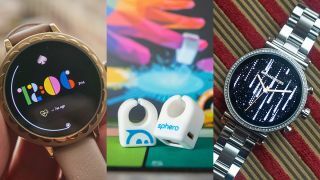 Here we're going to pick out seven of the best wearables that impressed us in Las Vegas – these are the devices you should think about picking up over the next 12 months before we come back and do CES all over again in early 2020. We love a good sequel as much as the next person, and the Kate Spade Scallop 2 doesn't disappoint – if you needed more proof that smartwatches don't have to be chunky and masculine, here it is. The wearable is designed specifically for women, but it would suit anyone with smaller wrists and good taste. Parent company Fossil has added just about all the key features that the original Kate Spade Scallop smartwatch lacked: GPS, heart rate monitoring, and an NFC chip for Google Pay duties. You'll now be able to track the route of your morning run without a phone, see how it affected your heart, and buy a coffee at the end of it. With a 3ATM water resistance rating, this'll work for swimming too. We like the subtle and stylish design choices here, though more variations would be welcome – not much has changed in terms of the looks of the watch, though that's not much of a problem as the aesthetics were pretty much spot on the first time around. The Kate Spade Scallop 2 launches in the US this month for $295-$335 (about £230-£260 / AU$410-$470, with worldwide availability to be confirmed). The latest version of Wear OS is on board too, with easy Google Assistant access and more. You thought a portable ECG monitor would be exclusive to the Apple Watch 4 for good? Introducing the Withings Move ECG. The latest smartwatch from the company (freshly reacquired from Nokia) brings with it an integrated electrocardiogram monitor for spotting an irregular heartbeat. That means you can use the wearable to flag up potential problems like atrial fibrillation without having to trail down to the doctor's (though you will of course need an official diagnosis too). Unlike the Apple Watch, this will pair with Android as well as iOS phones, and at $129.95 / £129.95 (about AU$230 with an Australian launch yet to be confirmed) it's a lot cheaper than Apple's wearable too. Other than that flagship ECG feature this is very much business as usual for Withings. We've always liked the suave and understated hybrid smartwatch designs bearing the Withings name, and this one is no different. The non-ECG Withings Move has a lot more in the way of color options, which might suit you better. It's perfect for those who want the look of a traditional watch with some extra fitness tracking – and heart monitoring – features thrown in for a decent price. The wearable is expected to launch between March and the end of July 2019. Chinese company Mobvoi is quietly making a name for its TicWatch brand in the world of Wear OS smartwatches, and the two TicWatch devices announced at CES 2019 get a joint 'best of' award in the wearables category. Both second-gen models add waterproofing up to 50 meters for some swimming tracking. There's actually not too much difference between the TicWatch E2 and the TicWatch S2 – they both have the same specs inside (featuring the Qualcomm Snapdragon Wear 2100 chipset), and they're both available in a black polycarbonate finish. A white version of the S2 model is also on the way apparently. The biggest difference is in the design, with the E (express) model a little more understated than the S (sport) model. Take your pick based on whichever you prefer. Also in the improvements column is 30% better battery life over the original TicWatch E and TicWatch S, and the latest version of Wear OS is on board. Part of the TicWatch appeal is in the low price: this hasn't been confirmed, but the original watches sold for $159.99 or around £120 (the TicWatch E) and $199.99 or around £150 (the TicWatch S) and these new models should be similarly priced. A smartwatch that interfaces with your car to tell it how stressed you are? This is the sort of technology that CES is all about, which is why the new Mercedes-Benz-branded Vívoactive 3 from Garmin earns a place on our list. Even if you don't drive a Mercedes, you have to be impressed with this. As the name suggests, this is a Garmin Vivoactive 3 at heart, with smart notifications, on-board GPS and a wealth of sports tracking features. Garmin is one of the best in the business at putting out fully featured smartwatches, and the Vivoactive 3 remains one of the most impressive models in its line-up. Enter Mercedes-Benz: with this new version, as well as some aesthetic tweaks the watch also interfaces directly with the Mercedes Me mobile app on a connected mobile phone. That lets your motor know what kind of physical and mental state you're in and make adjustments accordingly. What that means is you'll be able to choose "less stressful" routes in the navigation panel or switch on soothing music over the speakers. You might even be offered a seat massage or different heat settings inside the vehicle. It feels like the future, and that's what we're looking for at CES. If you've ever set out for the day only to realize your smartwatch is out of battery then the idea of a wearable that charges itself from your body heat is always going to appeal – and with the PowerWatch 2, Matrix has added solar charging as well, to make sure your watch never runs out of juice. The PowerWatch 2 looks to be a huge improvement over the original – there's the solar panel around the edge that we've already mentioned, plus GPS and a heart rate monitor. More power sources obviously means more power, because the screen is now color rather than monochrome too. The PowerWatch 2, like its predecessor, runs a custom OS, so you don't get the broad range of apps you might find with something running Wear OS or watchOS. That said, all the basics are well covered, including fitness tracking and phone notifications. The device also integrates with Strava, Google Fit and Apple HealthKit. Convinced? The PowerWatch 2 is apparently going to retail for $499 (which is around £390 or AU$695) when it launches fully later in the year, but if you're quick you can get one for $199 (around £155 or AU$275) by signing up and supporting the Indiegogo campaign. And now for something completely different... well, a little bit different. Sphero – the company of rolling robot fame – has taken the opportunity of CES 2019 to launch the Specdrums educational gadgets. These little smart rings let kids make music with a few taps of their fingers. It's part of Sphero's recent push into STEAM education – science, technology, engineering, art and maths – and the dinky devices first appeared as a Kickstarter project a couple of years ago before Sphero got involved. Now they're here, and very impressive they are too. You simply tap a Specdrum on a colored surface to make a sound: the ring detects the color you're tapping on and changes the note accordingly. Via a connected app, it's possible to switch between different instruments, and you can even create your own colored surfaces (a mat comes supplied to get you started). One ring will set you back $64.99/£64.99/AU$109.99. Any kids in your household are likely to get a kick out of playing around with them, but we think there are going to be a few adults having a go with these too. Last but absolutely not least in our best wearables of CES 2019 list is the Michael Kors Access Sofie 2.0 smartwatch – quite a mouthful to say but very appealing in terms of its design and the features on offer here. If you're interested in the premium end of the Wear OS market, take a look. We've got no complaints about the amount of technology that's packed in here: GPS, NFC (for mobile payments) and heart rate monitoring are all built in, and with the latest version of Wear OS (complete with Google Assistant) you should be able to do everything you would expect from a smartwatch with the Michael Kors Access Sofie 2.0. The design and finish are fantastic too – the smartwatch is launching in silver, gold, rose gold, and silver-with-gold-accents. A choice of metal and silicone straps are going to be available so you can switch between gym and evening dinner modes as needed. With a rather vague release date of "summer 2019" you might have to wait a while to get your hands (or wrists) on this, but we might hear more about it at the Baselworld 2019 expo in March. We're still waiting on a price too, though we reckon this'll be pricier than your average Wear OS smartwatch.